As Mick Lynch, frontman of 80s indie outsiders Stump passes away, Getintothis’ Del Pike looks back fondly on this most unlikely of musical heroes. With the news of Stump frontman Mick Lynch passing away last month, it seems another true original has left us too soon. 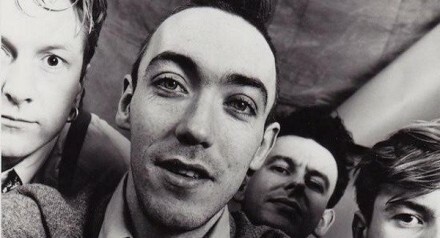 One of the unsung heroes of the 80s indie scene, Cork’s Lynch was the spokesman for those of us who liked our music leftfield and unique. Borrowing from Captain Beefheart but with their own insane Irish twang, Stump first burst into many of our lives following the video for Buffalo, made specially for and first aired on Channel 4’s The Tube in 1986. The track which some saw as a novelty song was a barbed attack on American consumer and tourist culture, its lyrics mimicking the inane ramblings of stereotypical American tourists “How Much is the fish…how much is the chips…How do I get off the bus?? ?” The track was to appear on side one of the landmark NME C86 cassette. Those brave enough to venture further could find much to enjoy on the Mud on a Colon 12” E.P and their mini-album Quirk Out which found Buffalo alongside the equally manic Tupperware Stripper. The song tells of a man in yellowing Y-fronts performing his exotic dance to a group of middle aged Tupperware ladies. To enter into the world of Stump was a wonderful thing. Alongside fellow Stumpers, Kev Hopper, Chris Salmon and Rob Mckahey, Lynch cut a weird figure with his wiry body and enormous King Kurt quiff. Signing to Chrysalis in 1988 was too much for some fans but at least the music wasn’t compromised. Their only full length album; A Fierce Pancake contained some of their finest moments and spawned the insane Chaos single, a sea shanty like no other, and the cinematic masterpiece, Charlton Heston. A song whose chorus was simply, “Charlton Heston put his vest on” played against the backdrop of a plague of frogs. The humour of Mick Lynch is what makes his untimely death so sorrowful, his immaturity and schoolboy attitude turned into something quite dark. Stump played a one off gig in 2015 after nearly three decades of silence and fans anticipated a possible tour. With those hopes now dashed it is certainly time to revisit those mad, mad records and dwell on the fact that they were probably not taken as seriously as they should have been. The three disc retrospective, Stump – The Complete Anthology is recommended.